At Alan’s Factory Outlet, we sell dependable and stylish metal buildings in more than two dozen states, including Oklahoma, and we pride ourselves on our fast, free delivery. After all, we know that our customers want to get their vehicles and other possessions under protective covering as soon as possible. Alan’s Factory Outlet understands the importance of providing customers with efficient, prompt service, and we are proud to offer quality products as well as top-notch customer service! Our garages are built in many different sizes and styles, so you can choose from one-car, two-car, or even three-car garages in Oklahoma. No matter what you’ve got to store, we can help you keep it safe! Our steel garages in Oklahoma are built with 14-gauge tubing and 29-gauge sheeting. Thicker 12-gauge tubing is available as well, and it comes with a 20-year rust-through warranty. Our metal garages in OK are typically anchored to the ground for free with rebar or to your concrete pad with concrete anchor bolts. Mobile home anchors are also available. Our steel buildings also come with center braces. A garage that is fully braced on both sides is another option. Certified Oklahoma metal garages are another option. When you order a certified metal garage, blueprint drawings are faxed to your local building inspector. While some locations require blueprint drawings, others don’t. Our certified metal garages are rated for 130 mph winds and a 30 psf snow load. When you purchase a certified package, your garage will be fully braced and have mobile home anchors or additional concrete anchor bolts to give it a 130 mph wind rating. A certified metal garage order entails some additional costs; certified metal garages require more tubing on both the front and back ends. Buying a metal building in Oklahoma can cost anywhere between $3,445 and $8,825 depending on what size you choose. These can range from 18 by 36 feet to 24 by 41 feet. You can find more information on our pricing page. Free delivery is included in purchases of our metal garages. Oklahoma residents also have their metal buildings set up for free. Alan’s Factory Outlet metal buildings in Oklahoma are all built on site and finished on the day they arrive, so you’ll be able to use them right away. Customers have many reasons for purchasing our metal garages. Oklahoma residents buy them to protect their cars and trucks from harsh weather conditions. Some people buy our metal garages to protect vehicles from rusting or sitting in water. Many people purchase our metal garages to keep their vehicles safe from animals that can damage parts of a car. Our metal garages are ideal for people who own classic cars that they want to keep in tip-top condition. 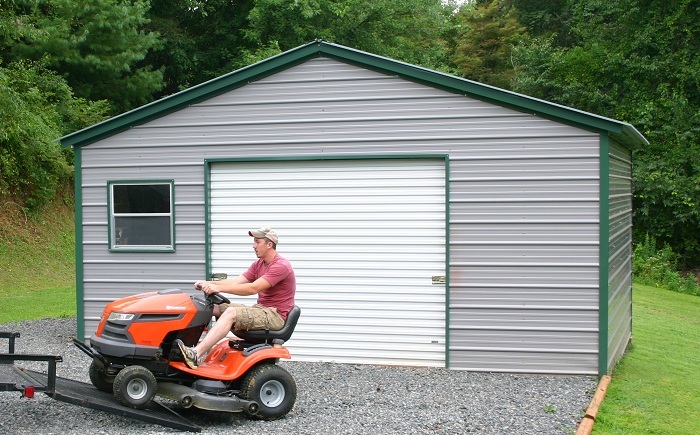 Under the protection of a metal garage, lawn mowers and other yard equipment also stay clean and dry. Not surprisingly, this can help a homeowner to avoid costly repairs on lawn equipment. Each of our customers has unique reasons for purchasing one or more of our quality metal garages. At Alan’s Factory Outlet, we believe that a metal garage can be attractive as well as protective. After all, if a metal garage is going to become a part of a homeowner’s property, it should be appealing to look at! 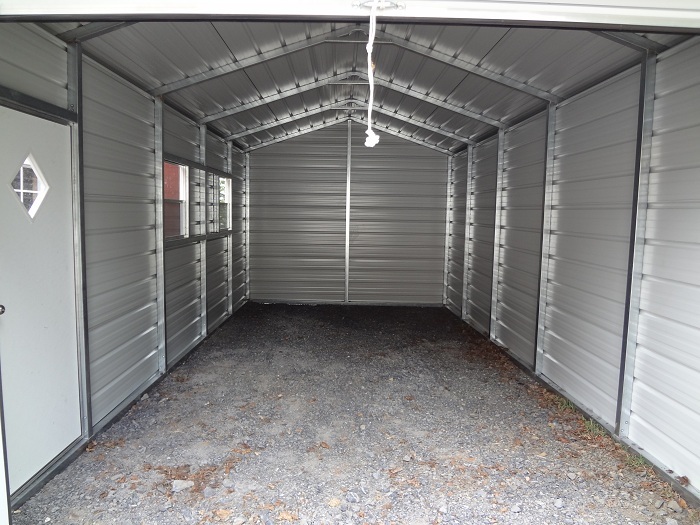 We design our metal garages so they will contribute to the overall appearance of a piece of property. 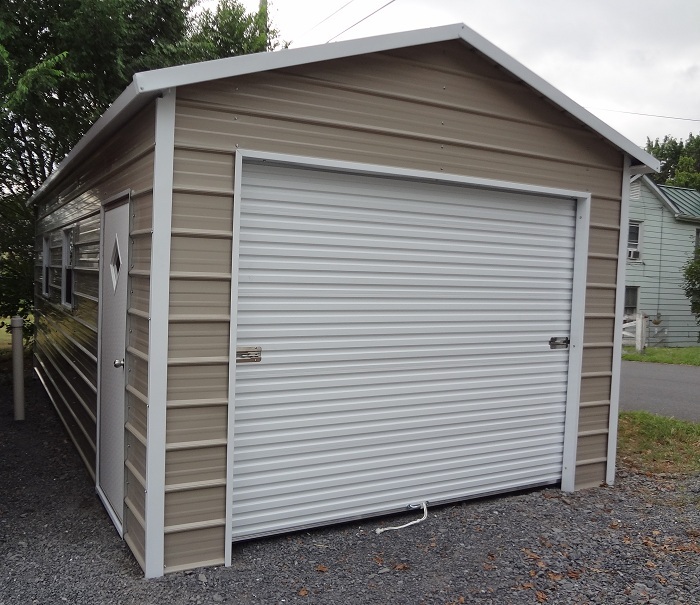 Our metal garages are available in different colors for the sides, roof, and trim, so homeowners have the opportunity to coordinate them with their house. We have three roof styles for our metal garages: Oklahoma residents get their choice of regular style, boxed-eave style, and vertical style. Furthermore, our customers have a choice of 13 different colors for their metal garages. In Oklahoma, residents have plenty of choices when buying one of our quality metal buildings! If you don’t need a fully enclosed metal garage, check out our metal carports, which are also delivered and set up for free in all of OK. You could also order a carport and partially enclose it by closing the sides or the sides and back. No matter what you’re looking for, we can help to create it!